According to a report from Matt Moore of CBSSports.com on Friday night, Nov. 22, NBA star guard Derrick Rose once again suffered a knee injury. The incident happened when the Bulls point guard was visiting for a game against the Portland Trailblazers. The injury actually occurred on the opposite leg from the one in which Rose tore his ACL in April of 2012. 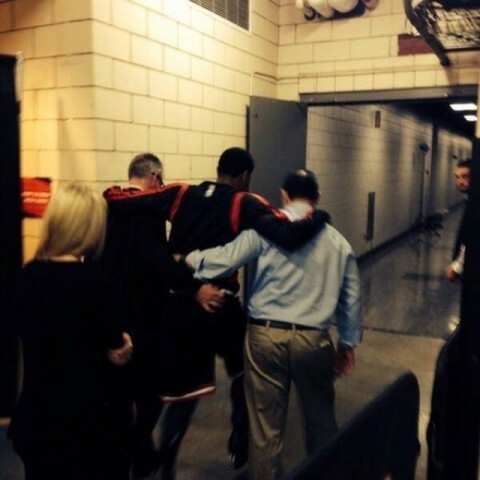 That injury caused Rose to miss the remainder of the playoff season as well as the entire 2012-2013 season. On Friday night, there was no contact with Rose, as he simply saw it buckle underneath him as he was running underneath the basket. This season, Rose was far from his best, as he produced averages of 15 points per game on just 36 percent shooting. Rose is expected to have an MRI on Saturday. Twitter user iropp would post a photo of the incident after the game, as Rose was shown getting assistance as he went to the dressing room. The Bulls are 6-5 this season.